You can grab her right now over in the shop along with lots of other New Releases!!! Huge thanks to everyone who joined in the blog hop!! I hope you enjoyed it?? Congrats ladies please Email me to claim your prize!! And don't forget to chek out all the DT girls blogs to see if you've won anything over there!!! ALL THE NEW RELEASES ARE NOW AVAILABLE IN THE SHOP! I'll be back tomorrow with a Tuesday Treat! Wonderful card, Emma! Just love how you followed the theme right through! WOWWWWWWWWWWWW..........totally awesome card love the image on the cards it looks fantastic hun. Fabulous card Paula. 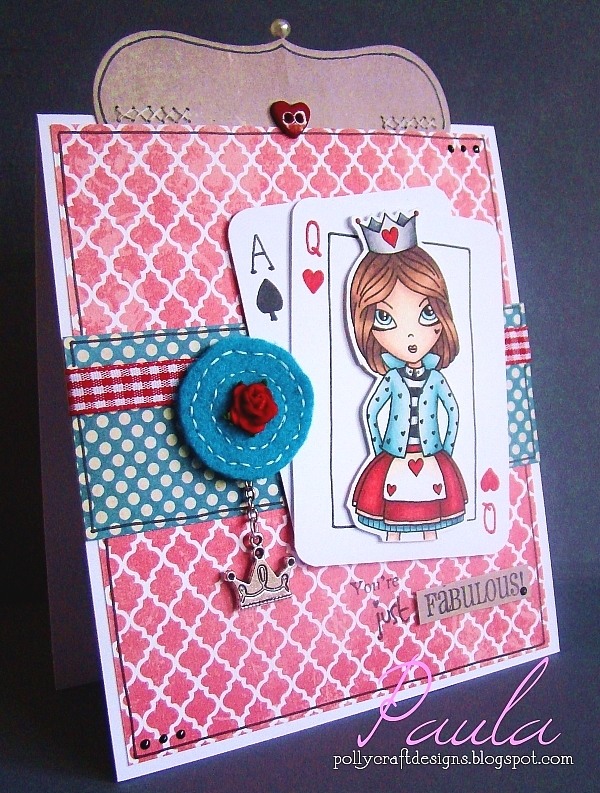 I love the playing cards you used behind that gorgeous image - so creative. The felt circle and charm are lovely too. I love this Paula, you're sooooo clever hon! Ooooo, charms in the shop, wahooooo!! I love your card Paula! She's so lovely! The cards you made are fab! I had to do a double take when you said you made them! Ooh and I love the charm!